FILE - British Prime Minister Theresa May speaks during a media conference at the conclusion of an EU summit in Brussels, Nov. 25, 2018. 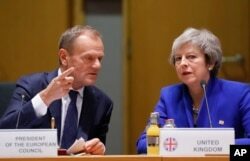 FILE - British Prime Minister Theresa May and European Council President Donald Tusk attend a round table meeting at an EU summit in Brussels, Nov. 25, 2018. 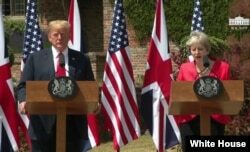 FILE - Britain's Prime Minister Theresa May and U.S. President Donald Trump hold a joint news conference at Chequers, the official country residence of the prime minister, in Buckinghamshire, England, July 13, 2018. 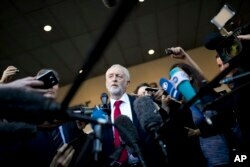 FILE - British Labor party leader Jeremy Corbyn talks to journalists outside the European Commission headquarters in Brussels, Belgium, Sept. 27, 2018.